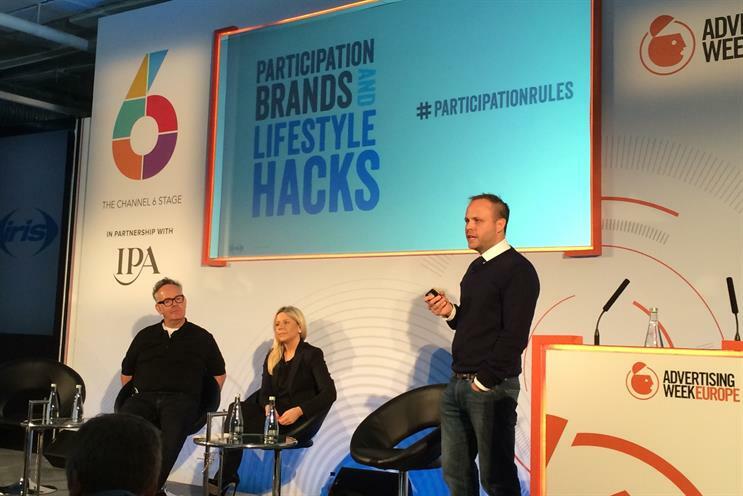 Brands should "bake participation" into marketing activity to fully engage consumers, said Mini's head of brand communications at London's Advertising Week Europe 2014. Michelle Roberts, Mini UK’s general manager of brand communications, said the BMW-owned marque was a "natural-born participation brand" that puts its customers and prospective customers at the heart of all its marketing. "It’s all about consistency of experience," she said. "So every time you touch the brand you have a consistent experience, whether that’s through communications, though dealerships, through dealerships/retail stores the people you engage with Mini. The session was examining the concept of lifestyle hacking - where brands create experiences for consumers in the real world, extending beyond the limits of their product or service. "We’re talking about the art of branding through the prism of experience and everything that means these days," said Sam Noble, chief strategy officer of Iris, who chaired the panel. He said that there are traditionally "two tribes" of marketing to provide the answers - on one side brand and on the other the "world of increasingly sophisticated buying processes, consumer journeys, big data". Neither is actually providing those answers, he asserted: "Brands have to do a much better job of hacking into and becoming intrinsically linked to the flow of people’s lifestyles." Noble went on to outline five concepts of lifestyle hacking, including tribal identity and social currency, the latter the notion of "making brands and content units of social currency by existing in the spaces and moments between people". Someone a few years ago said that they prefer to visit the dentist than visit a dealership. It is a barrier and we have to work really hard to ensure that have this consistency. Meanwhile, Mark Earls, former planner and author of ‘How to Change Mass Behaviour by Harnessing Our True Nature’, agreed that historically marketers have thought about brands in terms of their relationships with individuals, but should instead be thinking more about what goes on in the spaces between people. He argued that marketers often favoured individual choice over social choice, when the latter is a more powerful engagement tool. "Marketing has forgotten this and that’s why marketing a brand based on the space between people is a really exciting and innovative thing to do." He cited samples including Apple’s white earphones and how their colour has entered the public’s social consciousness. Mini’s Roberts talked of changing perceptions and conventions. "Someone a few years ago said that they prefer to visit the dentist than visit a dealership," she said. "It is a barrier and we have to work really hard to ensure that have this consistency. And we do that cleverly - by being innovative and customer-centric. We look for ways to bring the brand experience to life for customers." Roberts gave several examples of how Mini has been lifestyle hacking, such as piloting pop-up shops in shopping meccas to allow consumers to engage with the brand "on their terms rather than expecting them to come to us". The customer is given the key to their new Mini via the car being revealed on a rotating plinth with sufficient fanfare to make it a memorable experience for the customer. Being controversial is another means of engaging with consumers on a participatory level, she added: "Of course for brands to be topical and to punch above their brand weight, they have to become part of the discussion." But Roberts warned that being topical "requires parameters - being agile and knowing your limits". An example of this approach was last year when the brand entered the discussions around horsemeat. She also talked of a recent ad campaign that featured real-life Mini owners as the stars of the ads. "We don’t do this participation on top of everything we do," she said. "We have to bake it into our standard marketing activities." Joining the panel later on John Grant, author and co-founder of The Iris Nursery and St Luke’s, said that while the idea of lifestyle hacking might seem "new and startling", it is not completely new. He referenced Bill Bowerman, the co-founder of Nike, who on a visit to New Zealand came across the concept of jogging and brought it back to America, where it became extremely popular and entered the social consciousness, as well as ultimately selling more Nike footwear.